The blackbody radiation problem is complicated but, when everything is said and done, what the analysis says is that the the ‘equipartition theorem’ in the kinetic theory of gases ‘theorem (or the ‘theorem concerning the average energy of the center-of-mass motion’, as Feynman terms it), is not correct. That equipartition theorem basically states that, in thermal equilibrium, energy is shared equally among all of its various forms. For example, the average kinetic energy per degree of freedom in the translation motion of a molecule should equal that of its rotational motions. That equipartition theorem is also quite precise: it also states that the mean energy, for each atom or molecule, for each degree of freedom, is kT/2. Hence, that’s the (average) energy the 19th century scientists also assigned to the atomic oscillators in a gas. However, the discrepancy between the theoretical and empirical result of their work shows that adding atomic oscillators–as radiators and absorbers of light–to the system (a box of gas that’s being heated) is not just a matter of adding additional ‘degree of freedom’ to the system. It can’t be analyzed in ‘classical’ terms: the actual spectrum of blackbody radiation shows that these atomic oscillators do not absorb, on average, an amount of energy equal to kT/2. Hence, they are not just another ‘independent direction of motion’. 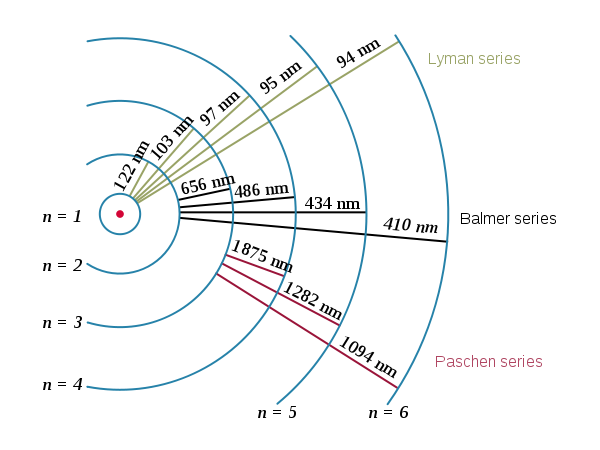 To solve the blackbody radiation problem, Planck assumed that the permitted energy levels of the atomic harmonic oscillator were equally spaced, at ‘distances’ ħω0 apart from each other. That’s what’s illustrated below. One thing to note is that the equal spacing consists of distances equal to ħω0, not of ħ. Hence, while h, or ħ (ħ is the constant to be used when the frequency is expressed in radians per second, rather than oscillations per second, so ħ = h/2π) is now being referred to as the quantum of action (das elementare Wirkungsquantum in German), Planck referred to it as as a Hilfsgrösse only (that’s why he chose the h as a symbol, it seems), so that’s an auxiliary constant only: the actual quantum of action is, of course, ΔE, i.e. 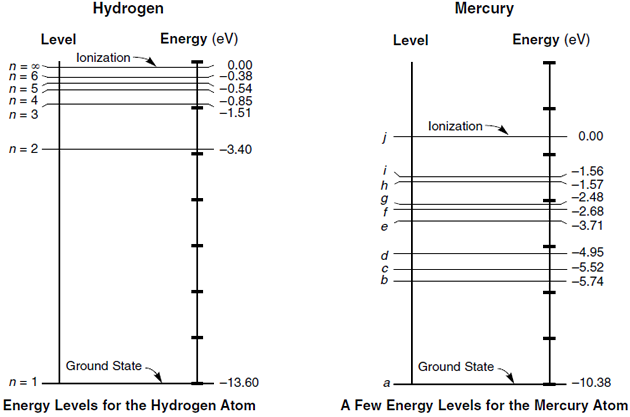 the difference between the various energy levels, which is the product of ħ and ω0 (or of h and ν0 if we express frequency in oscillations per second, rather than in angular frequency). Hence, Planck (and later Einstein) did not assume that an atomic oscillator emits or absorbs packets of energy as tiny as ħ or h, but packets of energy as big as ħω0 or, what amounts to the same (ħω = (h/2π)(2πν) = hν), hν0. Just to give an example, the frequency of sodium light (ν) is 500×1012 Hz, and so its energy is E = hν. That’s not a lot–about 2 eV only– but it still packs 500×1012 ‘quanta of action’ ! Another thing is that ω (or ν) is a continuous variable: hence, the assumption of equally spaced energy levels does not imply that energy itself is a discrete variable: light can have any frequency and, hence, we can also imagine photons with any energy level: the only thing we’re saying is that the energy of a photon of a specific color (i.e. a specific frequency ν) will be a multiple of hν. The second key assumption of Planck as he worked towards a solution of the blackbody radiation problem was that the probability (P) of occupying a level of energy E is P(E) = αe−E/kT. OK… Why not? But what is this assumption really? You’ll think of some ‘bell curve’, of course. But… No. That wouldn’t make sense. Remember that the energy has to be positive. The general shape of this P(E) curve is shown below. The highest probability density is near E = 0, and then it goes down as E gets larger, with kT determining the slope of the curve (just take the derivative). In short, this assumption basically states that higher energy levels are not so likely, and that very high energy levels are very unlikely. Indeed, this formula implies that the relative chance, i.e. the probability of being in state E1 relative to the chance of being in state E0, is P1/P0 = e−(E1–E0)kT = e−ΔE/kT. Now, P1 is n1/N and P0 is n0/N and, hence, we find that n1 must be equal to n0e−ΔE/kT. What this means is that the atomic oscillator is less likely to be in a higher energy state than in a lower one. That makes sense, doesn’t it? I mean… I don’t want to criticize those 19th century scientists but… What were they thinking? Did they really imagine that infinite energy levels were as likely as… Well… More down-to-earth energy levels? I mean… A mechanical spring will break when you overload it. Hence, I’d think it’s pretty obvious those atomic oscillators cannot be loaded with just about anything, can they? Garbage in, garbage out: of course, that theoretical spectrum of blackbody radiation didn’t make sense! Thus we let N0 be the number of oscillators that are in the ground state (the lowest energy state); N1 the number of oscillators in the state E1; N2 the number that are in state E2; and so on. According to the hypothesis (which we have not proved) that in quantum mechanics the law that replaced the probability e−P.E./kT or e−K.E./kT in classical mechanics is that the probability goes down as e−ΔE/kT, where ΔE is the excess energy, we shall assume that the number N1 that are in the first state will be the number N0 that are in the ground state, times e−ħω/kT. Similarly, N2, the number of oscillators in the second state, is N2 =N0e−2ħω/kT. To simplify the algebra, let us call e−ħω/kT = x. Then we simply have N1 = N0x, N2 = N0x2, …, Nn = N0xn. The total energy of all the oscillators must first be worked out. If an oscillator is in the ground state, there is no energy. If it is in the first state, the energy is ħω, and there are N1 of them. So N1ħω, or ħωN0x is how much energy we get from those. Those that are in the second state have 2ħω, and there are N2 of them, so N2⋅2ħω=2ħωN0x2 is how much energy we get, and so on. Then we add it all together to get Etot = N0ħω(0+x+2x2+3x3+…). Is the analysis necessarily discrete? One question I can’t answer, because I just am not strong enough in math, is the question or whether or not there would be any other way to derive the actual blackbody spectrum. I mean… This analysis obviously makes sense and, hence, provides a theory that’s consistent and in accordance with experiment. However, the question whether or not it would be possible to develop another theory, without having recourse to the assumption that energy levels in atomic oscillators are discrete and equally spaced with the ‘distance’ between equal to hν0, is not easy to answer. I surely can’t, as I am just a novice, but I can imagine smarter people than me have thought about this question. The answer must be negative, because I don’t know of any other theory: quantum mechanics obviously prevailed. Still… I’d be interested to see the alternatives that must have been considered. = –1+(1+x+x2+x3…) = –1 + 1/(1–x) = –(1–x)+1/(1–x) = x/(1–x). Note the tricky bit: if x = e−ħω/kT, then eħω/kT is x−1 = 1/x, and so we have (1/x)–1 in the denominator of that (mean) energy formula, not 1/(x–1). Now 1/[(1/x)–1)] = 1/[(1–x)/x] = x/(1–x), indeed, and so the formula comes out alright. If you made it here, it means you’re totally fed up with all of the easy stories on quantum mechanics: diffraction, double-slit experiments, imaginary gamma-ray microscopes,… You’ve had it! You now know what quantum mechanics is all about, and you’ve realized all these thought experiments never answer the tough question: where did Planck find that constant (h) which pops up everywhere? And how did he find that Planck relation which seems to underpin all and everything in quantum mechanics? If you don’t know, that’s because you’ve skipped the blackbody radiation story. So let me give it to you here. What’s blackbody radiation? That’s what the blackbody radiation problem is about: thermal equilibrium of radiation. Yes. Imagine a box with gas inside. You’ll often see it’s described as a furnace, because we heat the box. Hence, the box, and everything inside, acquires a certain temperature, which we then assume to be constant. The gas inside will absorb energy and start emitting radiation, because the gas atoms or molecules are atomic oscillators. Hence, we have electrons getting excited and then jumping up and down from higher to lower energy levels, and then again and again and again, thereby emitting photons with a certain energy and, hence, light of a certain frequency. To put it simply: we’ll find light with various frequencies in the box and, in thermal equilibrium, we should have some distribution of the intensity of the light according to the frequency: what kind of radiation do we find in the furnace? Well… Let’s find out. OK. That’s easy enough to understand. However, the actual analysis of this equilibrium situation is what gave rise to the ‘problem’ of blackbody radiation in the 19th century which, as you know, led Planck and Einstein to develop a quantum-mechanical view of things. It turned out that the classical analysis predicted a distribution of the intensity of light that didn’t make sense, and no matter how you looked at it, it just didn’t come out right. Theory and experiment did not agree. Now, that is something very serious in science, as you know, because it means your theory isn’t right. In this case, it was disastrous, because it meant the whole of classical theory wasn’t right. To be frank, the analysis is not all that easy. It involves all that I’ve learned so far: the math behind oscillators and interference, statistics, the so-called kinetic theory of gases and what have you. I’ll try to summarize the story but you’ll see it requires quite an introduction. Equal volumes of different gases, at the same pressure and temperature, will have the same number of molecules. In such view of things, temperature is actually nothing but the mean kinetic energy of those molecules (or atoms if it’s a monatomic gas). However, now that we’re here, let me give you an inkling of how we derive that law. A classical (Newtonian) analysis of the collisions (you can find the detail in Feynman’s Lectures, I-39-2) will yield the following equation: P = (2/3)n〈mv2/2〉, with n the number of atoms or molecules per unit volume. So the pressure of a gas (which, as you know, is the force (of a gas on a piston, for example) per unit area: P = F/A) is also equal to the mean kinetic energy of the gas molecules multiplied by (2/3)n. If we multiply that equation by V, we get PV = N(2/3)〈mv2/2〉. However, we know that equal volumes of volumes of different gases, at the same pressure and temperature, will have the same number of molecules, so we have PV = N(2/3)〈m1v12/2〉 = N(2/3)〈m2v22/2〉, which we write as PV = NkT with kT = (2/3)〈m1v12/2〉 = (2/3)〈m2v22/2〉. In other words, that factor of proportionality k is the one we have to use to convert the temperature as measured by 〈mv2/2〉 (i.e. the mean kinetic energy expressed in joules) to T (i.e. the temperature expressed in the measure we’re used to, and that’s degrees Kelvin–or Celsius or Fahrenheit, but let’s stick to Kelvin, because that’s what’s used in physics). Vice versa, we have 〈mv2/2〉 = (3/2)kT. Now, that constant of proportionality k is equal to k = 1.38×10–23 joule per Kelvin (J/K). So if T is (absolute) temperature, expressed in Kelvin (K), our definition says that the mean molecular kinetic energy is (3/2)kT. For monatomic gas, that U would only be the kinetic energy of the atoms, and so we can write it as U = (2/3)NkT. Hence, we have the grand result that the kinetic energy, for each atom, is equal to (3/2)kT, on average that is. What about non-monatomic gas? Well… For complex molecules, we’d also have energy going into the rotational and vibratory motion of the atoms within the molecule, separate from what is usually referred to as the center-of-mass (CM) motion of the molecules themselves. Now, I’ll again refer you to Feynman for the detail of the analysis, but it turns out that, if we’d have, for example, a diatomic molecule, consisting of an A and B atom, the internal rotational and vibratory motion would, indeed, also absorb energy, and we’d have a total energy equal to (3/2)kT + (3/2)kT = 2×(3/2)kT = 3kT. Now, that amount (3kT) can be split over (i) the energy related to the CM motion, which must still be equal to (3/2)kT, and (ii) the average kinetic energy of the internal motions of the diatomic molecule excluding the bodily motion of the CM. Hence, the latter part must be equal to 3kT – (3/2)kT = (3/2)kT. So, for the diatomic molecule, the total energy happens to consist of two equal parts. The kinetic energy for the CM motion of each molecule is, and will always be, (3/2)kT. The remainder, i.e. r(3/2)kT – (3/2)kT = (3/2)(r–1)kt, is internal vibrational and rotational kinetic energy, i.e. the sum of all vibratory and rotational kinetic energy but excluding the energy of the CM motion of the molecule. Phew! That’s quite something. And we’re not quite there yet. Photon gas? What’s that? Well… Imagine our box is the gas in a very hot star, hotter than the sun. As Feynman writes it: “The sun is not hot enough; there are still too many atoms, but at still higher temperatures in certain very hot stars, we may neglect the atoms and suppose that the only objects that we have in the box are photons.” Well… Let’s just go along with it. We know that photons have no mass but they do have some very tiny momentum, which we related to the magnetic field vector, as opposed to the electric field. It’s tiny indeed. Most of the energy of light goes into the electric field. However, we noted that we can write p as p = E/c, with c the speed of light (3×108). Now, we had that P = (2/3)n〈mv2/2〉 formula for gas, and we know that the momentum p is defined as p = mv. So we can substitute mv2 by (mv)v = pv. So we get P = (2/3)n〈pv/2〉 = (1/3)n〈pv〉. Temperature is a measure of the average kinetic energy of the atoms or molecules in a gas. More specifically, it’s related to the mean kinetic energy of the CM motion of the atoms or molecules, which is equal to (3/2)kT, with k the Boltzmann constant and T the temperature expressed in Kelvin (i.e. the absolute temperature). If gas atoms or molecules have additional ‘degrees of freedom’, aka ‘independent directions of motion’, then each of these will absorb additional energy, namely kT/2. Oscillators have a natural frequency, usually denoted by the (angular) frequency ω0. The sum of the potential and kinetic energy stored in an oscillator is a constant, unless there’s some damping constant. In that case, the oscillation dies out. Here, you’ll remember the concept of the Q of an oscillator. If there’s some damping constant, the oscillation will die out and the relevant formula is 1/Q = (dW/dt)/(ω0W) = γ/ω0, with γ the damping constant (not to be confused with the γ we used in that PVγ = C formula). Just to make sure we know what we’re talking about (one would forget, wouldn’t one? ), kT is the product of the Boltzmann constant (1.38×10–23 J/K) and the temperature of the gas (so note that the product is expressed in joule indeed). Hence, that product is the average energy of our atomic oscillators in the gas in our furnace. Next we ask how much light must be shining on the oscillator. It must be enough that the energy absorbed from the light (and thereupon scattered) is just exactly this much. In other words, the emitted light is accounted for as scattered light from the light that is shining on the oscillator in the cavity. So we must now calculate how much light is scattered from the oscillator if there is a certain amount—unknown—of radiation incident on it. Let I(ω)dω be the amount of light energy there is at the frequency ω, within a certain range dω (because there is no light at exactly a certain frequency; it is spread all over the spectrum). So I(ω) is a certain spectral distribution which we are now going to find—it is the color of a furnace at temperature T that we see when we open the door and look in the hole. Now how much light is absorbed? We worked out the amount of radiation absorbed from a given incident light beam, and we calculated it in terms of a cross section. It is just as though we said that all of the light that falls on a certain cross section is absorbed. So the total amount that is re-radiated (scattered) is the incident intensity I(ω)dω multiplied by the cross section σ. This formula is Rayleigh’s law. [And, yes, it’s the same Rayleigh – Lord Rayleigh, I should say respectfully – as the one who invented that criterion I introduced in my previous post, but so this law and that criterion have nothing to do with each other.] This ‘law’ gives the intensity, or the distribution, of light in a furnace. Feynman says it’s referred to as blackbody radiation because “the hole in the furnace that we look at is black when the temperature is zero.” […] OK. Whatever. What we call it doesn’t matter. The point is that this function tells us that the intensity goes as the square of the frequency, which means that if we have a box at any temperature at all, and if we look at it, the X- and gamma rays will be burning out eyes out ! The graph below shows both the theoretical curve for two temperatures (T0 and 2T0), as derived above (see the solid lines), and then the actual curves for those two temperatures (see the dotted lines). This is the so-called UV catastrophe: according to classical physics, an ideal black body at thermal equilibrium should emit radiation with infinite power. In reality, of course, it doesn’t: Rayleigh’s law is false. Utterly false. And so that’s where Planck came to the rescue, and he did so by assuming radiation is being emitted and/or absorbed in finite quanta: multiples of h, in fact. Indeed, Planck studied the actual curve and fitted it with another function. That function assumed the average energy of a harmonic oscillator was not just proportional with the temperature (T), but that it was also a function of the (natural) frequency of the oscillators. By fiddling around, he found a simple derivation for it which involved a very peculiar assumption. That assumption was that the harmonic oscillator can take up energies only ħω at the time, as shown below. The gas consists of a large number of atomic oscillators, each with their own natural frequency ω0. The permitted energy levels of these harmonic oscillator are equally spaced and ħω0 apart. The probability of occupying a level of energy E is P(E) = αe–E/kT. In my previous post, I derived and explained the general formula for the pattern generated by a light beam going through a slit or a circular aperture: the diffraction pattern. For light going through an aperture, this generates the so-called Airy pattern. 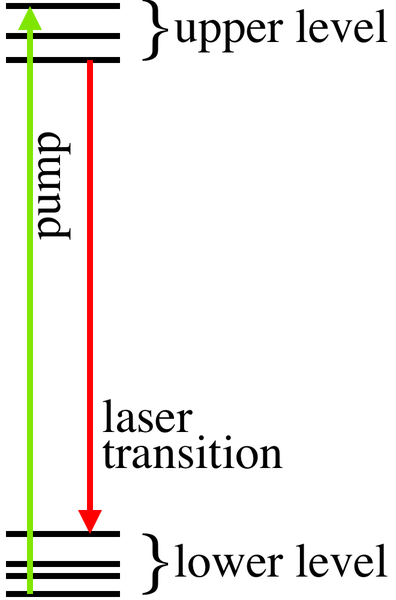 In practice, diffraction causes a blurring of the image, and may make it difficult to distinguish two separate points, as shown below (credit for the image must go to Wikipedia again, I am afraid). What’s actually going on is that the lens acts as a slit or, if it’s circular (which is usually the case), as an aperture indeed: the wavefront of the transmitted light is taken to be spherical or plane when it exits the lens and interferes with itself, thereby creating the ring-shaped diffraction pattern that we explained in the previous post. The spatial resolution is also known as the angular resolution, which is quite appropriate, because it refers to an angle indeed: we know the first minimum (i.e. the first black ring) occurs at an angle θ such that sinθ = λ/L, with λ the wavelength of the light and L the lens diameter. It’s good to remind ourselves of the geometry of the situation: below we picture the array of oscillators, and so we know that the first minimum occurs at an angle such that Δ = λ. The second, third, fourth etc minimum occurs at an angle θ such that Δ = 2λ, 3λ, 4λ, etc. However, these secondary minima do not play any role in determining the resolving power of a lens, or a telescope, or an electron microscope, etc, and so you can just forget about them for the time being. If we have two point sources right next to each other, they will create two Airy disks, as shown above, which may overlap. That may make it difficult to see them, in a telescope, a microscope, or whatever device. Hence, telescopes, microscopes (using light or electron beams or whatever) have a limited resolving power. How do we measure that? Note that, in this equation, θ stands for the angular resolution, λ for the wavelength of the light being used, and L is the diameter of the (aperture of) the lens. In the first of the three images above, the two points are well separated and, hence, the angle between them is well above the angular resolution. In the second, the angle between just meets the Rayleigh criterion, and in the third the angle between them is smaller than the angular resolution and, hence, the two points are not resolved. This simplified formula is called Dawes’ limit, and you’ll often see it used instead of Rayleigh’s criterion. However, the fact that it’s exactly the same formula as our formula for the first minimum of the Airy pattern should not confuse you: angular resolution is something different. Now, after this introduction, let me get to the real topic of this post: Heisenberg’s Uncertainty Principle according to Heisenberg. I don’t know about you but, as a kid, I didn’t know much about waves and fields and all that, and so I had difficulty understanding why the resolving power of a microscope or any other magnifying device depended on the frequency or wavelength. I now know my understanding was limited because I thought the concept of the amplitude of an electromagnetic wave had some spatial meaning, like the amplitude of a water or a sound wave. You know what I mean: this false idea that an electromagnetic wave is something that sort of wriggles through space, just like a water or sound wave wriggle through their medium (water and air respectively). Now I know better: the amplitude of an electromagnetic wave measures field strength and there’s no medium (no aether). So it’s not like a wave going around some object, or making some medium oscillate. I am not ashamed to acknowledge my stupidity at the time: I am just happy I finally got it, because it helps to really understand Heisenberg’s own illustration of his Uncertainty Principle, which I’ll present now. 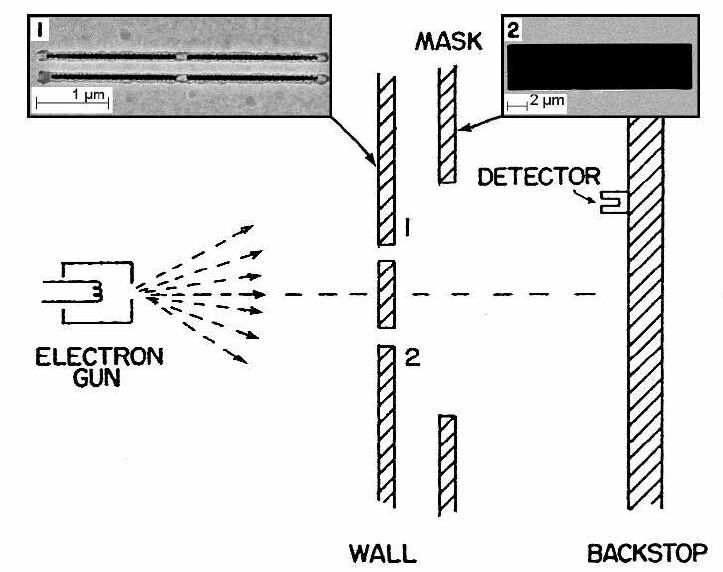 Heisenberg imagined a gamma-ray microscope, as shown below (I copied this from the website of the American Institute for Physics ). Gamma-ray microscopes don’t exist – they’re hard to produce: you need a nuclear reactor or so 🙂 – but, as Heisenberg saw the development of new microscopes using higher and higher energy beams (as opposed to the 1.5-3 eV light in the visible spectrum) so as to increase the angular resolution and, hence, be able to see smaller things, he imagined one could use, perhaps, gamma-rays for imaging. Gamma rays are the hardest radiation, with frequencies of 10 exaherz and more (or >1019 Hz) and, hence, energies above 100 keV (i.e. 100,000 more than photons in the visible light spectrum, and 1000 times more than the electrons used in an average electron microscope). Gamma rays are not the result of some electron jumping from a higher to a lower energy level: they are emitted in decay processes of atomic nuclei (gamma decay). But I am digressing. Back to the main story line. So Heisenberg imagined we could ‘shine’ gamma rays on an electron and that we could then ‘see’ that electron in the microscope because some of the gamma photons would indeed end up in the microscope after their ‘collision’ with the electron, as shown below. What Heisenberg basically meant to show is that this set-up would allow us to gather precise information on the position of the electron–because we would know where it was–but that, as a result, we’d lose information in regard to its momentum. Why? To put it simply: because the electron recoils as a result of the interaction. The point, of course, is to calculate the exact relationship between the two (position and momentum). In other words: what we want to do is to state the Uncertainty Principle quantitatively, not qualitatively. Now, the animation above uses the symbol L for the γ-ray wavelength λ, which is confusing because I used L for the diameter of the aperture in my explanation of diffraction above. The animation above also uses a different symbol for the angular resolution: A instead of θ. So let me borrow the diagram used in the Wikipedia article and rephrase the whole situation. Now, because of the recoil effect, the electron receives some momentum from the γ-ray photon. How much? Well… The situation is somewhat complicated (much more complicated than the Wikipedia article on this very same topic suggests), because the photon keeps some but also gives some of its original momentum. In fact, what’s happening really is Compton scattering: the electron first absorbs the photon, and then emits another with a different energy and, hence, also with different frequency and wavelength. However, what we do now is that the photon’s original momentum was equal to E/c= p = h/λ. That’s just the Planck relation or, if you’d want to look at the photon as a particle, the de Broglie equation. The scattered photon goes to the left edge of the lens. Hence, its horizontal momentum is negative (because it moves to the left) and the momentum px will be distributed over the electron and the photon such that px = p’x –h(ε/2)/λ’. Why the ε/2 factor? Well… That’s just trigonometry: the horizontal momentum of the scattered photon is obviously only a tiny fraction of its original horizontal momentum, and that fraction is given by the angle ε/2. The scattered photon goes to the right edge of the lens. In that case, we write px = p”x + h(ε/2)/λ”. Now that yields ΔpΔx = 2h, which is an approximate expression of Heisenberg’s Uncertainty Principle indeed (don’t worry about the factor 2, as that’s something that comes with all of the approximations). A final moot point perhaps: it is obviously a thought experiment. Not only because we don’t have gamma-ray microscopes (that’s not relevant because we can effectively imagine constructing one) but because the experiment involves only one photon. 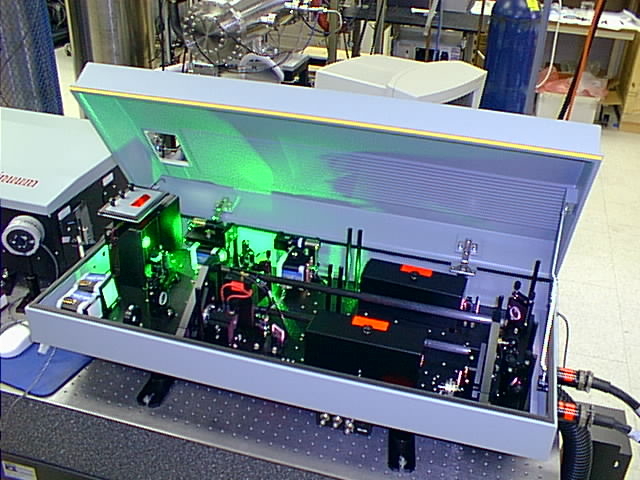 A real microscope would organize a proper beam, but that would obviously complicate the analysis. In fact, it would defeat the purpose, because the whole point is to analyze one single interaction here. We can analyze γ-ray photons, or any photon for that matter, as particles having some momentum, and when ‘colliding’, or interacting, with an electron, the photon will impart some momentum to that electron. Momentum is being conserved and, hence, the total (linear) momentum before and after the collision, considering both particles–i.e. (1) the incoming ray and the electron before the interaction and (2) the emitted photon and the electron that’s getting the kick after the interaction–must be the same. For the γ-ray photon, we can relate (or associate, if you prefer that term) its wavelength λ with its momentum p through the Planck relation or, what amounts to the same for photons (because they have no mass), the de Broglie relation. Now, these assumptions are then applied to an analysis of what we know to be true from experiment, and that’s the phenomenon of diffraction, part of which is the observation that the resolving power of a microscope is limited, and that its resolution is given by the θ = λ/D equation. Bringing it all together, then gives us a theory which is consistent with experiment and, hence, we then assume the theory is true. Why? Well… I could start a long discourse here on the philosophy of science but, when everything is said and done, we should admit we don’t any ‘better’ theory. In his Lectures, Feynman advances the double-slit experiment with electrons as the textbook example explaining the “mystery” of quantum mechanics. It shows interference–a property of waves–of ‘particles’, electrons: they no longer behave as particles in this experiment. While it obviously illustrates “the basic peculiarities of quantum mechanics” very well, I think the dual behavior of light – as a wave and as a stream of photons – is at least as good as an illustration. And he could also have elaborated the phenomenon of electron diffraction. Indeed, the phenomenon of diffraction–light, or an electron beam, interfering with itself as it goes through one slit only–is equally fascinating. Frankly, I think it does not get enough attention in textbooks, including Feynman’s, so that’s why I am devoting a rather long post to it here. To be fair, Feynman does use the phenomenon of diffraction to illustrate the Uncertainty Principle, both in his Lectures as well as in that little marvel, QED: The Strange Theory of Light of Matter–a must-read for anyone who wants to understand the (probability) wave function concept without any reference to complex numbers or what have you. Let’s have a look at it: light going through a slit or circular aperture, illustrated in the left-hand image below, creates a diffraction pattern, which resembles the interference pattern created by an array of oscillators, as shown in the right-hand image. Let’s start with the right-hand illustration, which illustrates interference, not diffraction. We have eight point sources of electromagnetic radiation here (e.g. radio waves, but it can also be higher-energy light) in an array of length L. λ is the wavelength of the radiation that is being emitted, and α is the so-called intrinsic relative phase–or, to put it simply, the phase difference. We assume α is zero here, so the array produces a maximum in the direction θout = 0, i.e. perpendicular to the array. There are also weaker side lobes. That’s because the distance between the array and the point where we are measuring the intensity of the emitted radiation does result in a phase difference, even if the oscillators themselves have no intrinsic phase difference. Interference patterns can be complicated. In the set-up below, for example, we have an array of oscillators producing not just one but many maxima. In fact, the array consists of just two sources of radiation, separated by 10 wavelengths. The explanation is fairly simple. Once again, the waves emitted by the two point sources will be in phase in the east-west (E-W) direction, and so we get a strong intensity there: four times more, in fact, than what we would get if we’d just have one point source. Indeed, the waves are perfectly in sync and, hence, add up, and the factor four is explained by the fact that the intensity, or the energy of the wave, is proportional to the square of the amplitude: 22 = 4. We get the first minimum at a small angle away (the angle from the normal is denoted by ϕ in the illustration), where the arrival times differ by 180°, and so there is destructive interference and the intensity is zero. To be precise, if we draw a line from each oscillator to a distant point and the difference Δ in the two distances is λ/2, half an oscillation, then they will be out of phase. So this first null occurs when that happens. If we move a bit further, to the point where the difference Δ is equal to λ, then the two waves will be a whole cycle out of phase, i.e. 360°, which is the same as being exactly in phase again! And so we get many maxima (and minima) indeed. But this post should not turn into a lesson on how to construct a radio broadcasting array. 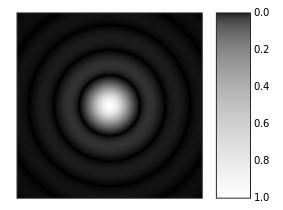 The point to note is that diffraction is usually explained using this rather simple theory on interference of waves assuming that the slit itself is an array of point sources, as illustrated below (while the illustrations above were copied from Feynman’s Lectures, the ones below were taken from the Wikipedia article on diffraction). This is referred to as the Huygens-Fresnel Principle, and the math behind is summarized in Kirchhoff’s diffraction formula. Now, that all looks easy enough, but the illustration above triggers an obvious question: what about the spacing between those imaginary point sources? Why do we have six in the illustration above? The relation between the length of the array and the wavelength is obviously important: we get the interference pattern that we get with those two point sources above because the distance between them is 10λ. If that distance would be different, we would get a different interference pattern. But so how does it work exactly? If we’d keep the length of the array the same (L = 10λ) but we would add more point sources, would we get the same pattern? The easy answer is yes, and Kirchhoff’s formula actually assumes we have an infinite number of point sources between those two slits: every point becomes the source of a spherical wave, and the sum of these secondary waves then yields the interference pattern. The animation below shows the diffraction pattern from a slit with a width equal to five times the wavelength of the incident wave. The diffraction pattern is the same as above: one strong central beam with weaker lobes on the sides. However, the truth is somewhat more complicated. 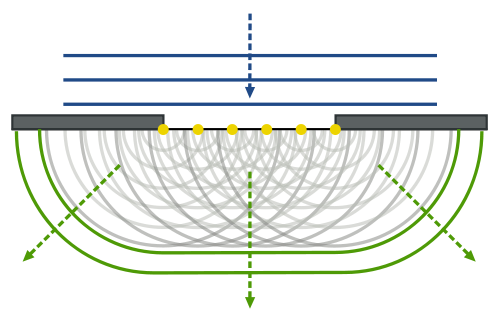 The illustration below shows the interference pattern for an array of length L = 10λ–so that’s like the situation with two point sources above–but with four additional point sources to the two we had already. The intensity in the E–W direction is much higher, as we would expect. Adding six waves in phase yields a field strength that is six times as great and, hence, the intensity (which is proportional to the square of the field) is thirty-six times as great as compared to the intensity of one individual oscillator. Also, when we look at neighboring points, we find a minimum and then some more ‘bumps’, as before, but then, at an angle of 30°, we get a second beam with the same intensity as the central beam. Now, that’s something we do not see in the diffraction patterns above. So what’s going on here? Before I answer that question, I’d like to compare with the quantum-mechanical explanation. It turns out that this question in regard to the relevance of the number of point sources also pops up in Feynman’s quantum-mechanical explanation of diffraction. The illustration below (taken from Feynman’s QED, p. 55-56) presents the quantum-mechanical point of view. It is assumed that light consists of a photons, and these photons can follow any path. Each of these paths is associated with what Feynman simply refers to as an arrow, but so it’s a vector with a magnitude and a direction: in other words, it’s a complex number representing a probability amplitude. In order to get the probability for a photon to travel from the source (S) to a point (P or Q), we have to add up all the ‘arrows’ to arrive at a final ‘arrow’, and then we take its (absolute) square to get the probability. The text under each of the two illustrations above speaks for itself: when we have ‘enough’ arrows (i.e. when we allow for many neighboring paths, as in the illustration on the left), then the arrows for all of the paths from S to P will add up to one big arrow, because there is hardly any difference in time between them, while the arrows associated with the paths to Q will cancel out, because the difference in time between them is fairly large. Hence, the light will not go to Q but travel to P, i.e. in a straight line. However, when the gap is nearly closed (so we have a slit or a small aperture), then we have only a few neighboring paths, and then the arrows to Q also add up, because there is hardly any difference in time between them too. 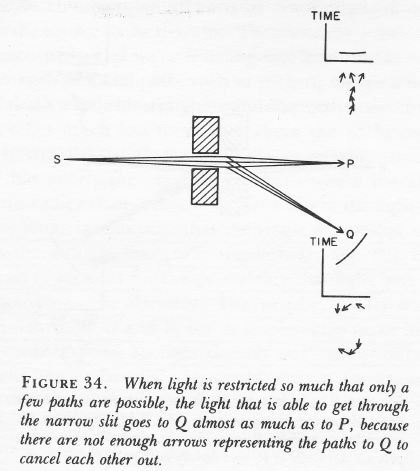 As I am quoting from Feynman’s QED here, let me quote all of the relevant paragraph: “Of course, both final arrows are small, so there’s not much light either way through such a small hole, but the detector at Q will click almost as much as the one at P ! So when you try to squeeze light too much to make sure it’s going only in a straight line, it refuses to cooperate and begins to spread out. This is an example of the Uncertainty Principle: there is a kind of complementarity between knowledge of where the light goes between the blocks and where it goes afterwards. Precise knowledge of both is impossible.” (Feynman, QED, p. 55-56). Feynman’s quantum-mechanical explanation is obviously more ‘true’ that the classical explanation, in the sense that it corresponds to what we know is true from all of the 20th century experiments confirming the quantum-mechanical view of reality: photons are weird ‘wavicles’ and, hence, we should indeed analyze diffraction in terms of probability amplitudes, rather than in terms of interference between waves. That being said, Feynman’s presentation is obviously somewhat more difficult to understand and, hence, the classical explanation remains appealing. In addition, Feynman’s explanation triggers a similar question as the one I had on the number of point sources. Not enough arrows !? What do we mean with that? Why can’t we have more of them? What determines their number? Let’s first look at their direction. Where does that come from? Feynman is a wonderful teacher here. He uses an imaginary stopwatch to determine their direction: the stopwatch starts timing at the source and stops at the destination. But all depends on the speed of the stopwatch hand of course. So how fast does it turn? Feynman is a bit vague about that but notes that “the stopwatch hand turns around faster when it times a blue photon than when it does when timing a red photon.” In other words, the speed of the stopwatch hand depends on the frequency of the light: blue light has a higher frequency (645 THz) and, hence, a shorter wavelength (465 nm) then red light, for which f = 455 THz and λ = 660 nm. 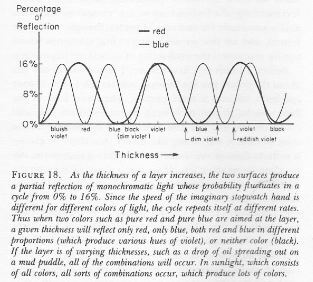 Feynman uses this to explain the typical patterns of red, blue, and violet (separated by borders of black), when one shines red and blue light on a film of oil or, more generally,the phenomenon of iridescence in general, as shown below. As for the size of the arrows, their length is obviously subject to a normalization condition, because all probabilities have to add up to 1. But what about their number? We didn’t answer that question–yet. The answer, of course, is that the number of arrows and their size are obviously related: we associate a probability amplitude with every way an event can happen, and the (absolute) square of all these probability amplitudes has to add up to 1. Therefore, if we would identify more paths, we would have more arrows, but they would have to be smaller. The end result would be the same though: when the slit is ‘small enough’, the arrows representing the paths to Q would not cancel each other out and, hence, we’d have diffraction. You’ll say: Hmm… OK. I sort of see the idea, but how do you explain that pattern–the central beam and the smaller side lobes, and perhaps a second beam as well? Well… You’re right to be skeptical. In order to explain the exact pattern, we need to analyze the wave functions, and that requires a mathematical approach rather than the type of intuitive approach which Feynman uses in his little QED booklet. Before we get started on that, however, let me give another example of such intuitive approach. Let’s look at that very first illustration again, which I’ve copied, for your convenience, again below. Feynman uses it (III-2-2) to (a) explain the diffraction pattern which we observe when we send electrons through a slit and (b) to illustrate the Uncertainty Principle. What’s the story? Well… Before the electrons hit the wall or enter the slit, we have more or less complete information about their momentum, but nothing on their position: we don’t know where they are exactly, and we also don’t know if they are going to hit the wall or go through the slit. So they can be anywhere. However, we do know their energy and momentum. That momentum is horizontal only, as the electron beam is normal to the wall and the slit. Hence, their vertical momentum is zero–before they hit the wall or enter the slit that is. We’ll denote their (horizontal) momentum, i.e. the momentum before they enter the slit, as p0. Now, if an electron happens to go through the slit, and we know because we detected it on the other side, then we know its vertical position (y) at the slit itself with considerable accuracy: that position will be the center of the slit ±B/2. So the uncertainty in position (Δy) is of the order B, so we can write: Δy = B. However, according to the Uncertainty Principle, we cannot have precise knowledge about its position and its momentum. In addition, from the diffraction pattern itself, we know that the electron acquires some vertical momentum. Indeed, some electrons just go straight, but more stray a bit away from the normal. From the interference pattern, we know that the vast majority stays within an angle Δθ, as shown in the plot. Hence, plain trigonometry allows us to write the spread in the vertical momentum py as p0Δθ, with p0 the horizontal momentum. So we have Δpy = p0Δθ. That shows that the uncertainty in regard to the vertical momentum is, indeed, inversely proportional to the uncertainty in regard to its position (Δy), which is the slit width B. But we can go one step further. The de Broglie relation relates wavelength to momentum: λ = h/p. What momentum? Well… Feynman is a bit vague on that: he equates it with the electron’s horizontal momentum, so he writes λ = h/p0. Is this correct? Well… Yes and no. The de Broglie relation associates a wavelength with the total momentum, but then it’s obvious that most of the momentum is still horizontal, so let’s go along with this. What about the wavelength? What wavelength are we talking about here? It’s obviously the wavelength of the complex-valued wave function–the ‘probability wave’ so to say. Wow ! Did Feynman ‘prove’ Heisenberg’s Uncertainty Principle here? Well… No. Not really. First, the ‘proof’ above actually assumes there’s fundamental uncertainty as to the position and momentum of a particle (so it actually assumes some uncertainty principle from the start), and then it derives it from another fundamental assumption, i.e. the de Broglie relation, which is obviously related to the Uncertainty Principle. Hence, all of the above is only an illustration of the Uncertainty Principle. It’s no proof. As far as I know, one can’t really ‘prove’ the Uncertainty Principle: it’s a fundamental assumption which, if accepted, makes our observations consistent with the theory that is based on it, i.e. quantum or wave mechanics. Finally, note that everything that I wrote above also takes the diffraction pattern as a given and, hence, while all of the above indeed illustrates the Uncertainty Principle, it’s not an explanation of the phenomenon of diffraction as such. For such explanation, we need a rigorous mathematical analysis, and that’s a classical analysis. Let’s go for it! The mathematics involved in analyzing diffraction and/or interference are actually quite tricky. If you’re alert, then you should have noticed that I used two illustrations that both have six oscillators but that the interference pattern doesn’t match. I’ve reproduced them below. The illustration on the right-hand side has six oscillators and shows a second beam besides the central one–and, of course, there’s such beam also 30° higher, so we have (at least) three beams with the same intensity here–while the animation on the left-hand side shows only one central beam. So what’s going on here? The answer is that, in the particular example on the left-hand side, the successive dipole radiators (i.e. the point sources) are separated by a distance of two wavelengths (2λ). In that case, it is actually possible to find an angle where the distance δ between successive dipoles is exactly one wavelength (note the little δ in the illustration, as measured from the second point source), so that the effects from all of them are in phase again. So each one is then delayed relative to the next one by 360 degrees, and so they all come back in phase, and then we have another strong beam in that direction! In this case, the other strong beam has an angle of 30 degrees as compared to the E-W line. If we would put in some more oscillators, to ensure that they are all closer than one wavelength apart, then this cannot happen. And so it’s not happening with light. 🙂 But now that we’re here, I’ll just quickly note that it’s an interesting and useful phenomenon used in diffraction gratings, but I’ll refer you to the literature on that, as I shouldn’t be bothering you with all these digressions. So let’s get back at it. The intrinsic relative phase α, i.e. the difference in phase between one oscillator and the next: this is assumed to be zero in all of the examples of diffraction patterns above but so the mathematical analysis here is somewhat more general. The phase difference which results from the fact that we are observing the array in a given direction θ from the normal. Now that‘s the interesting bit, and it’s not so difficult to show that this additional phase is equal to 2πdsinθ/λ, with d the distance between two oscillators, λ the wavelength of the radiation, and θ the angle from the normal. Before I proceed, please note that we assume that d is less than λ, so we only have one great maximum, and that’s the so-called zero-order beam centered at θ = 0. In order to get subsidiary great maxima (referred to as first-order, second-order, etcetera beams in the context of diffraction gratings), we must have the spacing d of the array greater than one wavelength, but so that’s not relevant for what we’re doing here, and that is to move from a discrete analysis to a continuous one. Before we do that, let’s look at that curve again and analyze where the first minimum occurs. If we assume that α = 0 (no intrinsic relative phase), then the first minimum occurs when ϕ = 2π/n. Using the ϕ = α + 2πdsinθ/λ formula, we get 2πdsinθ/λ = 2π/n or ndsinθ = λ. What does that mean? Well, nd is the total length L of the array, so we have ndsinθ = Lsinθ = Δ = λ. What that means is that we get the first minimum when Δ is equal to one wavelength. What about the second minimum? Well… That occurs when ϕ = 4π/n. Using the ϕ = 2πdsinθ/λ formula again, we get 2πdsinθ/λ = 4π/n or ndsinθ = 2λ. So we get ndsinθ = Lsinθ = Δ = 2λ. So we get the second minimum at an angle θ such that Δ = 2λ. For the third minimum, we have ϕ = 6π/n. So we have 2πdsinθ/λ = 6π/n or ndsinθ = 3λ. So we get the third minimum at an angle θ such that Δ = 3λ. And so on and so on. The point to note is that the diffraction pattern depends only on the wavelength λ and the total length L of the array, which is the width of the slit of course. Hence, we can actually extend the analysis for n going from some fixed value to infinity, and we’ll find that we will only have one great maximum with a lot of side lobes that are much and much smaller, with the minima occurring at angles such that Δ = λ, 2λ, 3λ, etcetera. OK. What’s next? Well… Nothing. That’s it. I wanted to do a post on diffraction, and so that’s what I did. However, to wrap it all up, I’ll just include two more images from Wikipedia. The one on the left shows the diffraction pattern of a red laser beam made on a plate after passing a small circular hole in another plate. The pattern is quite clear. On the right-hand side, we have the diffraction pattern generated by ordinary white light going through a hole. In fact, it’s a computer-generated image and the gray scale intensities have been adjusted to enhance the brightness of the outer rings, because we would not be able to see them otherwise. 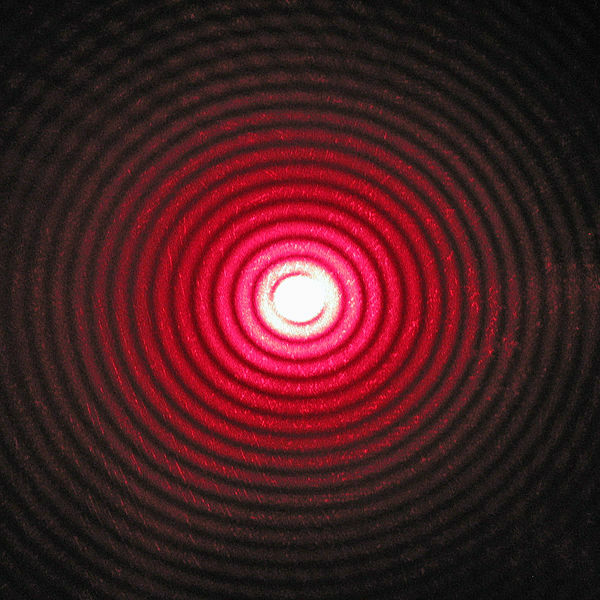 The diffraction pattern resulting from a uniformly-illuminated circular aperture has a bright region in the center, known as the Airy disk which together with the series of concentric bright rings around is called the Airy pattern. Important post script (PS) – dated 22 December 2018: Dear readers of this post, this is one of the more popular posts of my blog but – in the meanwhile – I did move on a bit, and many of the questions I get touch on the same topic: the analysis below is not entirely consistent. These questions are fully justified and I have been thinking differently as a result. The Q&A below sums up everything. At the same time, if you are interested in this question, you should probably also read the original post. Feynman’s classical idea of an atomic oscillator is fine in the context of the blackbody radiation problem, but his description of the photon as a long wavetrain does not make any sense. A photon has to pack two things: (1) the energy difference between the Bohr orbitals and (2) Planck’s constant h, which is the (physical) action associated with one cycle of an oscillation (so it’s a force over a distance (the loop or the radius – depending on the force you’re looking at) over a cycle time). See section V of the paper for how the fine-structure constant pops up here – it’s, as usual, a sort of scaling constant, but this time it scales a force. In any case, the idea is that we should think of a photon as one cycle – rather than a long wavetrain. The one cycle makes sense: when you calculate field strength and force you get quite moderate values (not the kind of black-hole energy concentrations some people suggest). It also makes sense from a logical point of view: the wavelength is something real, and so we should think of the photon amplitude (the electric field strength) as being real as well – especially when you think of how that photon is going to interact or be absorbed into another atom. Sorry for my late reply. It’s been a while since I checked the comments. Please let me know if this makes sense. I’ll have a look at your blog in the coming days. I am working on a new paper on the anomalous magnetic moment – which is not anomalous as all if you start to think about how things might be working in reality. After many years of study, I’ve come to the conclusion that quantum mechanics is a nice way of describing things, but it doesn’t help us in terms of understanding anything. When we want to understand something, we need to push the classical framework a lot further than we currently do. In any case, that’s another discussion. OK. Now you can move on the post itself. 🙂 Sorry if this is confusing the reader, but it is a necessary thing, I feel. I wouldn’t dare to argue with Feynman, of course, but… What? Well… Photons are like electrons, and then they are not. Obviously not, I’d say. For starters, photons do not have mass or charge, and they are also bosons, i.e. ‘force-carriers’ (as opposed to matter-particles), and so they obey very different quantum-mechanical rules, which are referred to as Bose-Einstein statistics. I’ve written about that in other post (see, for example, my post on Bose-Einstein and Fermi-Dirac statistics), so I won’t do that again here. It’s probably sufficient to remind the reader that these rules imply that the so-called Pauli exclusion principle does not apply to them: bosons like to crowd together, thereby occupying the same quantum state–unlike their counterparts, the so-called fermions or matter-particles: quarks (which make up protons and neutrons) and leptons (including electrons and neutrinos), which can’t do that: two electrons can only sit on top of each other if their spins are opposite (so that makes their quantum state different), and there’s no place whatsoever to add a third one–because there are only two possible ‘directions’ for the spin: up or down. From all that I’ve been writing so far, I am sure you have some kind of picture of matter-particles now, and notably of the electron: it’s not really point-like, because it has a so-called scattering cross-section (I’ll say more about this later), and we can find it somewhere taking into account the Uncertainty Principle, with the probability of finding it at point x at time t given by the absolute square of a so-called ‘wave function’ Ψ(x, t). But what about the photon? Unlike quarks or electrons, they are really point-like, aren’t they? And can we associate them with a psi function too? I mean, they have a wavelength, obviously, which is given by the Planck-Einstein energy-frequency relation: E = hν, with h the Planck constant and ν the frequency of the associated ‘light’. But an electromagnetic wave is not like a ‘probability wave’. So… Do they have a de Broglie wavelength as well? Before answering that question, let me present that ‘picture’ of the electron once again. Below, I’ve inserted another image, which gives a static picture (i.e. one that is not varying in time) of the wave function of a real-life electron. To be precise: it’s the wave function for an electron on the 5d orbital of a hydrogen orbital. You can see it’s much more complicated than those easy things above. However, the idea behind is the same. We have a complex-valued function varying in space and in time. I took it from Wikipedia and so I’ll just copy the explanation here: “The solid body shows the places where the electron’s probability density is above a certain value (0.02), as calculated from the probability amplitude.” What about these colors? Well… The image uses the so-called HSL color system to represent complex numbers: each complex number is represented by a unique color, with a different hue (H), saturation (S) and lightness (L). Just google if you want to know how that works exactly. OK. That should be clear enough. I wanted to talk about photons here. So let’s go for it. Well… Hmm… I realize I need to talk about some more ‘basics’ first. Sorry for that. So… Well… That’s a bit sloppy, isn’t it? Maybe. In Feynman’s Lectures, you’ll find an oft-quoted ‘application’ of the Uncertainty Principle leading to a pretty accurate calculation of the typical size of an atom (the so-called Bohr radius), which Feynman starts with an equally sloppy statement of the Uncertainty Principle, so he notes: “We needn’t trust our answer to within factors like 2, π etcetera.” Frankly, I used to think that’s ugly and, hence, doubt the ‘seriousness’ of such kind of calculations. Now I know it doesn’t really matter indeed, as the essence of the relationship is clearly not a 2, π or 2π factor. The essence is the uncertainty itself: it’s very tiny (and multiplying it with 2, π or 2π doesn’t make it much bigger) but so it’s there. Having said what I said above, I am well aware of the fact that saying that we cannot imagine this or that is what most people say. I am also aware of the fact that they usually say that to avoid having to explain something. So let me try to do something more worthwhile here. 1. First, I should note that ħ is so small because the second, as a unit of time, is so incredibly large. All is relative, of course. 🙂 For sure, we should express time in a more natural unit at the atomic or sub-atomic scale, like the time that’s needed for light to travel one meter. Let’s do it. Let’s express time in a unit that I shall call a ‘meter‘. Of course, it’s not an actual meter (because it doesn’t measure any distance), but so I don’t want to invent a new word and surely not any new symbol here. Hence, I’ll just put apostrophes before and after: so I’ll write ‘meter’ or ‘m’. When adopting the ‘meter’ as a unit of time, we get a value for ‘ħ‘ that is equal to (6.6×10−16 eV·s)(1/3×108 ‘meter’/second) = 2.2×10−8 eV·’m’. Now, 2.2×10−8 is a number that is still too tiny to imagine. 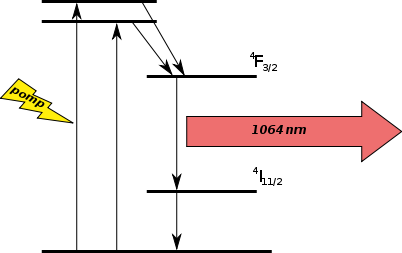 But then our ‘meter’ is still a rather huge unit at the atomic scale: we should take the ‘millimicron’, aka the ‘nanometer’ (1 nm = 1×10−9 m), or – even better because more appropriate – the ‘angstrom‘: 1 Å = 0.1 nm = 1×10−10 m. Indeed, the smallest atom (hydrogen) has a radius of 0.25 Å, while larger atoms will have a radius of about 1 or more Å. Now that should work, isn’t it? You’re right, we get a value for ‘ħ‘ equal to (6.6×10−16 eV·s)(1/3×108 ‘m’/s)(1×1010 ‘Å’/m) = 220 eV·’Å’, or 22 220 eV·’nm’. So… What? Well… If anything, it shows ħ is not a small unit at the atomic or sub-atomic level! Hence, we actually can start imagining how things work at the atomic level when using more adequate units. 2. Secondly, let’s do a quick dimension analysis of that ΔxΔp = h relation and/or its more accurate expression σx·σp ≥ ħ/2. A position (and its uncertainty or standard deviation) is expressed in distance units, while momentum… Euh… Well… What? […] Momentum is mass times velocity, so it’s kg·m/s. Hence, the dimension of the product on the left-hand side of the inequality is m·kg·m/s = kg·m2/s. So what about this eV·s dimension on the right-hand side? Well… The electronvolt is a unit of energy, and so we can convert it to joules. Now, a joule is a newton-meter (N·m), which is the unit for both energy and work: it’s the work done when applying a force of one newton over a distance of one meter. So we now have N·m·s for ħ, which is nice, because Planck’s constant (h or ħ—whatever: the choice for one of the two depends on the variables we’re looking at) is the quantum for action indeed. It’s a Wirkung as they say in German, so its dimension combines both energy as well as time. To put it simply, it’s a bit like power, which is what we men are interested in when looking at a car or motorbike engine. 🙂 Power is the energy spent or delivered per second, so its dimension is J/s, not J·s. However, your mind can see the similarity in thinking here. Energy is a nice concept, be it potential (think of a water bucket above your head) or kinetic (think of a punch in a bar fight), but it makes more sense to us when adding the dimension of time (emptying a bucket of water over your head is different than walking in the rain, and the impact of a punch depends on the power with which it is being delivered). In fact, the best way to understand the dimension of Planck’s constant is probably to also write the joule in ‘base units’. Again, one joule is the amount of energy we need to move an object over a distance of one meter against a force of one newton. So one J·s is one N·m·s is (1) a force of one newton acting over a distance of (2) one meter over a time period equal to (3) one second. I hope that gives you a better idea of what ‘action’ really is in physics. […] In any case, we haven’t answered the question. How do we relate the two sides? Simple: a newton is an oft-used SI unit, but it’s not a SI base unit, and so we should deconstruct it even more (i.e. write it in SI base units). If we do that, we get 1 N = 1 kg·m/s2: one newton is the force needed to give a mass of 1 kg an acceleration of 1 m/s per second. So just substitute and you’ll see the dimension on the right-hand side is kg·(m/s2)·m·s = kg·m2/s, so it comes out alright. Here there’s no confusion in regard to the units on both sides: we don’t need to convert to SI base units to see that they’re the same: [ΔE][Δt] = J·s. The ΔE·Δt = h expression is not so often used as an expression of the Uncertainty Principle. I am not sure why, and I don’t think it’s a good thing. Energy and time are also complementary variables in quantum mechanics, so it’s just like position and momentum indeed. In fact, I like the energy-time expression somewhat more than the position-momentum expression because it does not create any confusion in regard to the units on both sides: it’s just joules (or electronvolts) and seconds on both sides of the equation. So what? The energy and momentum of a particle are intimately related through the (relativistic) energy-momentum relationship. Now, that formula, E2 = p2c2 – m02c4, which links energy, momentum and intrinsic mass (aka rest mass), looks quite monstrous at first. Hence, you may prefer a simpler form: pc = Ev/c. It’s the same really as both are based on the relativistic mass-energy equivalence: E = mc2 or, the way I prefer to write it: m = E/c2. [Both expressions are the same, obviously, but we can ‘read’ them differently: m = E/c2 expresses the idea that energy has a equivalent mass, defined as inertia, and so it makes energy the primordial concept, rather than mass.] Of course, you should note that m is the total mass of the object here, including both (a) its rest mass as well as (b) the equivalent mass it gets from moving at the speed v. So m, not m0, is the concept of mass used to define p, and note how easy it is to demonstrate the equivalence of both formulas: pc = Ev/c ⇔ mvc = Ev/c ⇔ E = mc2. In any case, the bottom line is: don’t think of the energy and momentum of a particle as two separate things; they are two aspects of the same ‘reality’, involving mass (a measure of inertia, as you know) and velocity (as measured in a particular (so-called inertial) reference frame). Time and space are intimately related through the universal constant c, i.e. the speed of light, as evidenced by the fact that we will often want to express distance not in meter but in light-seconds (i.e. the distance that light travels (in a vacuum) in one second) or, vice versa, express time in meter (i.e. the time that light needs to travel a distance of one meter). These relationships are interconnected, and the following diagram shows how. The easiest way to remember it all is to apply the Uncertainty Principle, in both its ΔE·Δt = h as well as its Δp·Δx = h expressions, to a photon. A photon has no rest mass and its velocity v is, obviously, c. So the energy-momentum relationship is a very simple one: p = E/c. We then get both expressions of the Uncertainty Principle by simply substituting E for p, or vice versa, and remember that time and position (or distance) are related in exactly the same way: the constant of proportionality is the very same. It’s c. So we can write: Δx = Δt·c and Δt = Δx/c. If you’re confused, think about it in very practical terms: because the speed of light is what it is, an uncertainty of a second in time amounts, roughly, to an uncertainty in position of some 300,000 km (c = 3×108 m/s). Conversely, an uncertainty of some 300,000 km in the position amounts to a uncertainty in time of one second. That’s what the 1-2-3 in the diagram above is all about: please check if you ‘get’ it, because that’s ‘essential’ indeed. These two complementary equations give a ‘wavelength’ (λ) and/or a ‘frequency’ (f) of a de Broglie wave, or a ‘matter wave’ as it’s sometimes referred to. I am using, once again, apostrophes because the de Broglie wavelength and frequency are a different concept—different than the wavelength or frequency of light, or of any other ‘real’ wave (like water or sound waves, for example). To illustrate the differences, let’s start with a very simple question: what’s the velocity of a de Broglie wave? Well… […] So? You thought you knew, didn’t you? The mathematically (and physically) correct answer involves distinguishing the group and phase velocity of a wave. The ‘easy’ answer is: the de Broglie wave of a particle moves with the particle and, hence, its velocity is, obviously, the speed of the particle which, for electrons, is usually non-relativistic (i.e. rather slow as compared to the speed of light). The second thing to note is that, when we’re talking about the ‘frequency’ or ‘wavelength’ of ‘matter waves’ (i.e. de Broglie waves), we’re talking the frequency and wavelength of a wave with two components: it’s a complex-valued wave function, indeed, and so we get a real and imaginary part when we’re ‘feeding’ the function with some values for x and t.
You may say or think: What’s the problem here really? Well… If the probability to find a particle is the same anywhere, then the particle can be anywhere and, for all practical purposes, that amounts to saying it’s nowhere really. Hence, that wave function doesn’t serve the purpose. In short, that nice Ψ = Aei(ωt−kx) function is completely useless in terms of representing an electron, or any other actual particle moving through space. So what to do? So that’s what the wave we want indeed: a wave packet that travels through space but which is, at the same time, limited in space. Of course, you should note, once again, that it shows only one part of the complex-valued probability amplitude: just visualize the other part (imaginary if the wave above would happen to represent the real part, and vice versa if the wave would happen to represent the imaginary part of the probability amplitude). The animation basically illustrates a mathematical operation. To be precise, it involves a Fourier analysis or decomposition: it separates a wave packet into a finite or (potentially) infinite number of component waves. Indeed, note how, in the illustration above, the frequency of the component waves gradually increases (or, what amounts to the same, how the wavelength gets smaller and smaller) and how, with every wave we ‘add’ to the packet, it becomes increasingly localized. Now, you can easily see that the ‘uncertainty’ or ‘spread’ in the wavelength here (which we’ll denote by Δλ) is, quite simply, the difference between the wavelength of the ‘one-cycle wave’, which is equal to the space the whole wave packet occupies (which we’ll denote by Δx), and the wavelength of the ‘highest-frequency wave’. For all practical purposes, they are about the same, so we can write: Δx ≈ Δλ. Using Bohr’s formulation of the Uncertainty Principle, we can see the expression I used above (Δλ = hΔp) makes sense: Δx = Δλ = h/Δp, so ΔλΔp = h.
In fact, I was confused, for quite a few years actually, because I never quite understood whey there had to be a spread in the wavelength of a wave train. Indeed, we can all easily imagine a localized wave train with a fixed frequency and a fixed wavelength, like the one below, which I’ll re-use later. I’ve made this wave train myself: it’s a standard sine and cosine function multiplied with an ‘envelope’ function generating the envelope. As you can see, it’s a complex-valued thing indeed: the blue curve is the real part, and the imaginary part is the red curve. You can easily make a graph like this yourself. [Just use of one of those online graph tools.] This thing is localized in space and, as mentioned above, it has a fixed frequency and wavelength. So all those enigmatic statements you’ll find in serious or less serious books (i.e. textbooks or popular accounts) on quantum mechanics saying that “we cannot define a unique wavelength for a short wave train” and/or saying that “there is an indefiniteness in the wave number that is related to the finite length of the train, and thus there is an indefiniteness in the momentum” (I am quoting Feynman here, so not one of the lesser gods) are – with all due respect for these authors, especially Feynman – just wrong. I’ve made another ‘short wave train’ below, but this time it depicts the real part of a (possible) wave function only. Hmm… Now that one has a weird shape, you’ll say. It doesn’t look like a ‘matter wave’! Well… You’re right. Perhaps. [I’ll challenge you in a moment.] The shape of the function above is consistent, though, with the view of a photon as a transient electromagnetic oscillation. Let me come straight to the point by stating the basics: the view of a photon in physics is that photons are emitted by atomic oscillators. As an electron jumps from one energy level to the other, it seems to oscillate back and forth until it’s in equilibrium again, thereby emitting an electromagnetic wave train that looks like a transient. I need to move on. All of what I wrote above was ‘plain physics’, but so what I really want to explore in this post is a crazy hypothesis. Could these wave trains above – I mean the wave trains with the fixed frequency and wavelength – possible represent a de Broglie wave for a photon? However, these negative answers don’t discourage me from trying to do some more freewheeling. Before discussing whether or not the idea of a de Broglie wave for a photon makes sense, let’s think about mathematical constraints. I googled a bit but I only see one actually: the amplitudes of a de Broglie wave are subject to a normalization condition. Indeed, when everything is said and done, all probabilities must take a value between 0 and 1, and they must also all add up to exactly 1. So that’s a so-called normalization condition that obviously imposes some constraints on the (complex-valued) probability amplitudes of our wave function. But let’s get back to the photon. Let me remind you of what happens when a photon is being emitted by inserting the two diagrams below, which gives the energy levels of the atomic orbitals of electrons. So an electron absorbs or emits a photon when it goes from one energy level to the other, so it absorbs or emits radiation. And, of course, you will also remember that the frequency of the absorbed or emitted light is related to those energy levels. More specifically, the frequency of the light emitted in a transition from, let’s say, energy level E3 to E1 will be written as ν31 = (E3 – E1)/h. This frequency will be one of the so-called characteristic frequencies of the atom and will define a specific so-called spectral emission line. Now, from a mathematical point of view, there’s no difference between that ν31 = (E3 – E1)/h equation and the de Broglie equation, f = E/h, which assigns a de Broglie wave to a particle. But, of course, from all that I wrote above, it’s obvious that, while these two formulas are the same from a math point of view, they represent very different things. Again, let me repeat what I said above: a de Broglie wave is a matter-wave and, as such, it has nothing to do with an electromagnetic wave. We also know light has a very definite momentum, which I’ve calculated elsewhere and so I’ll just note the result: p = E/c. It’s a ‘pushing momentum’ referred to as radiation pressure, and its in the direction of travel indeed. In short, it does makes sense, in my humble opinion that is, to associate some wave function with the photon, and then I mean a de Broglie wave. Just think about it yourself. You’re right to say that a de Broglie wave is a ‘matter wave’, and photons aren’t matter but, having said that, photons do behave like like electrons, don’t they? There’s diffraction (when you send a photon through one slit) and interference (when photons go through two slits, altogether or – amazingly – one by one), so it’s the same weirdness as electrons indeed, and so why wouldn’t we associate some kind of wave function with them? Well… No. I am talking about something else here. Not some amplitude associated with a path in spacetime, but a wave function giving an approximate position of the photon. The third reaction may be the same as the reaction of those two nuclear scientists I asked: “No. It doesn’t make sense. We do not associate photons with a de Broglie wave.” But so they didn’t tell me why because… Well… They didn’t have the time to entertain a guy like me and so I didn’t dare to push the question and continued to explore it more in detail myself. So I’ve done that, and I thought of one reason why the question, perhaps, may not make all that much sense: a photon travels at the speed of light; therefore, it has no length. Hence, doing what I am doing below, and that’s to associate the electromagnetic transient with a de Broglie wave might not make sense. Maybe. I’ll let you judge. Before developing the point, I’ll raise two objections to the ‘objection’ raised above (i.e. the statement that a photon has no length). First, if we’re looking at the photon as some particle, it will obviously have no length. However, an electromagnetic transient is just what it is: an electromagnetic transient. I’ve see nothing that makes me think its length should be zero. In fact, if that would be the case, the concept of an electromagnetic wave itself would not make sense, as its ‘length’ would always be zero. Second, even if – somehow – the length of the electromagnetic transient would be reduced to zero because of its speed, we can still imagine that we’re looking at the emission of an electromagnetic pulse (i.e. a photon) using the reference frame of the photon, so that we’re traveling at speed c,’ riding’ with the photon, so to say, as it’s being emitted. Then we would ‘see’ the electromagnetic transient as it’s being radiated into space, wouldn’t we? Perhaps. I actually don’t know. That’s why I wrote this post and hope someone will react to it. I really don’t know, so I thought it would be nice to just freewheel a bit on this question. So be warned: nothing of what I write below has been researched really, so critical comments and corrections from actual specialists are more than welcome. As mentioned above, the answer in regard to the definition of a photon’s position and momentum is, obviously, unambiguous. Perhaps we have to stretch whatever we understand of Einstein’s (special) relativity theory, but we should be able to draw some conclusions, I feel. Let me say one thing more about the momentum here. As said, I’ll refer you to one of my posts for the detail but, all you should know here is that the momentum of light is related to the magnetic field vector, which we usually never mention when discussing light because it’s so tiny as compared to the electric field vector in our inertial frame of reference. Indeed, the magnitude of the magnetic field vector is equal to the magnitude of the electric field vector divided by c = 3×108, so we write B = E/c. Now, the E here stands for the electric field, so let me use W to refer to the energy instead of E. Using the B = E/c equation and a fairly straightforward calculation of the work that can be done by the associated force on a charge that’s being put into this field, we get that famous equation which we mentioned above already: the momentum of a photon is its total energy divided by c, so we write p = W/c. You’ll say: so what? Well… Nothing. I just wanted to note we get the same p = W/c equation indeed, but from a very different angle of analysis here. We didn’t use the energy-momentum relation here at all! In any case, the point to note is that the momentum of a photon is only a tiny fraction of its energy (p = W/c), and that the associated magnetic field vector is also just a tiny fraction of the electric field vector (B = E/c). But so it’s there and, in fact, when adopting a moving reference frame, the mix of E and B (i.e. the electric and magnetic field) becomes an entirely different one. One of the ‘gems’ in Feynman’s Lectures is the exposé on the relativity of electric and magnetic fields indeed, in which he analyzes the electric and magnetic field caused by a current, and in which he shows that, if we switch our inertial reference frame for that of the moving electrons in the wire, the ‘magnetic’ field disappears, and the whole electromagnetic effect becomes ‘electric’ indeed. I am just noting this because I know I should do a similar analysis for the E and B ‘mixture’ involved in the electromagnetic transient that’s being emitted by our atomic oscillator. However, I’ll admit I am not quite comfortably enough with the physics nor the math involved to do that, so… Well… Please do bear this in mind as I will be jotting down some quite speculative thoughts in what follows. So… A photon is, in essence, a electromagnetic disturbance and so, when trying to picture a photon, we can think of some oscillating electric field vector traveling through–and also limited in–space. [Note that I am leaving the magnetic field vector out of the analysis from the start, which is not ‘nice’ but, in light of that B = E/c relationship, I’ll assume it’s acceptable.] In short, in the classical world – and in the classical world only of course – a photon must be some electromagnetic wave train, like the one below–perhaps. But why would it have that shape? I only suggested it because it has the same shape as Feynman’s representation of a particle (see below) as a ‘probability wave’ traveling through–and limited in–space. So, what about it? Let me first remind you once again (I just can’t stress this point enough it seems) that Feynman’s representation – and most are based on his, it seems – is misleading because it suggests that ψ(x) is some real number. It’s not. In the image above, the vertical axis should not represent some real number (and it surely should not represent a probability, i.e. some real positive number between 0 and 1) but a probability amplitude, i.e. a complex number in which both the real and imaginary part are important. Just to be fully complete (in case you forgot), such complex-valued wave function ψ(x) will give you all the probabilities you need when you take its (absolute) square, but so… Well… We’re really talking a different animal here, and the image above gives you only one part of the complex-valued wave function (either the real or the imaginary part), while it should give you both. That’s why I find my graph below much better. 🙂 It’s the same really, but so it shows both the real as well as the complex part of a wave function. Regardless of the shortcomings of this graph, including the fact we only have some real-valued oscillation here, would it work as a ‘suggestion’ of how a real-life photon could look like? The charge q (i.e. the source of the radiation) is, of course, our electron that’s emitting the photon as it jumps from a higher to a lower energy level (or, vice versa, absorbing it). This formula basically states that the magnitude of the electric field (E) is proportional to the acceleration (a) of the charge (with t–r/c the retarded argument). Hence, the suggested shape of E as a function of x as shown above would imply that the acceleration of the electron is (a) initially quite small, (b) then becomes larger and larger to reach some maximum, and then (c) becomes smaller and smaller again to then die down completely. In short, it does match the definition of a transient wave sensu stricto (Wikipedia defines a transient as “a short-lived burst of energy in a system caused by a sudden change of state”) but it’s not likely to represent any real transient. So, we can’t exclude it, but a real transient is much more likely to look like something what’s depicted below: no gradual increase in amplitude but big swings initially which then dampen to zero. In other words, if our photon is a transient electromagnetic disturbance caused by a ‘sudden burst of energy’ (which is what that electron jump is, I would think), then its representation will, much more likely, resemble a damped wave, like the one below, rather than Feynman’s picture of a moving matter-particle. In fact, we’d have to flip the image, both vertically and horizontally, because the acceleration of the source and the field are related as shown below. The vertical flip is because of the minus sign in the formula for E(t). The horizontal flip is because of the minus sign in the (t – r/c) term, the retarded argument: if we add a little time (Δt), we get the same value for a(t−r/c) as we would have if we had subtracted a little distance: Δr=−cΔt. So that’s why E as a function of r (or of x), i.e. as a function in space, is a ‘reversed’ plot of the acceleration as a function of time. So we’d have something like below. It’s just what it is: an electromagnetic transient traveling through space. Would this be realistic as a ‘picture’ of a photon? Frankly, I don’t know. I’ve looked at a lot of stuff but didn’t find anything on this really. The easy answer, of course, is quite straightforward: we’re not interested in the shape of a photon because we know it is not an electromagnetic wave. It’s a ‘wavicle’, just like an electron. […] Sure. I know that too. Feynman told me. 🙂 But then why wouldn’t we associate some wave function with it? Please tell me, because I really can’t find much of an answer to that question in the literature, and so that’s why I am freewheeling here. So just go along with me for a while, and come up with another suggestion. As I said above, your bet is as good as mine. All that I know is that there’s one thing we need to explain when considering the various possibilities: a photon has a very well-defined frequency (which defines its color in the visible light spectrum) and so our wave train should – in my humble opinion – also have that frequency. At least for ‘quite a while’—and then I mean ‘most of the time’, or ‘on average’ at least. Otherwise the concept of a frequency – or a wavelength – wouldn’t make much sense. Indeed, if the photon has no defined wavelength or frequency, then we could not perceive it as some color (as you may or may not know, the sense of ‘color’ is produced by our eye and brain, but so it’s definitely associated with the frequency of the light). A photon should have a color (in phyics, that means a frequency) because, when everything is said and done, that’s what the Planck relation is all about. So that’s a very short time, but still, taking into account the rather spectacular frequency (500 THz) of sodium light, that still makes for some 16 million oscillations and, taking into the account the rather spectacular speed of light (3×108 m/s), that makes for a wave train with a length of, roughly, 9.6 meter. Huh? 9.6 meter!? You’re right. That’s an incredible distance: it’s like infinity on an atomic scale! So… Well… What to say? Such length surely cannot match the picture of a photon as a fundamental particle which cannot be broken up, can it? So it surely cannot be right because, if this would be the case, then there surely must be some way to break this thing up and, hence, it cannot be ‘elementary’, can it? Well… Maybe. But think it through. First note that we will not see the photon as a 10-meter long string because it travels at the speed of light indeed and so the length contraction effect ensure its length, as measured in our reference frame (and from whatever ‘real-life’ reference frame actually, because the speed of light will always be c, regardless of the speeds we mortals could ever reach (including speeds close to c), is zero. So… Well… Now it’s up to you. I am going along here with the assumption that a photon in the visible light spectrum, from a classical world perspective, should indeed be something that’s several meters long and packs a few million oscillations. So, while we usually measure stuff in seconds, or hours, or years, and, hence, while we would that think 10–8 seconds is short, a photon would actually be a very stretched-out transient that occupies quite a lot of space. I should also add that, in light of that number of ten meter, the dampening seems to happen rather slowly! I can see you shaking your head now, for various reasons. First because this type of analysis is not appropriate. […] You think so? Well… I don’t know. Perhaps you’re right. Perhaps we shouldn’t try to think of a photon as being something different than a discrete packet of energy. But then we also know it is an electromagnetic wave. So why wouldn’t we go all the way? What about the ‘vertical’ dimension, the y and the z coordinates in space? We’ve got this long snaky thing: how thick-bodied is it? Here, we need to watch our language. While it’s fairly obvious to associate a wave with a cross-section that’s normal to its direction of propagation, it is not obvious to associate a photon with the same thing. 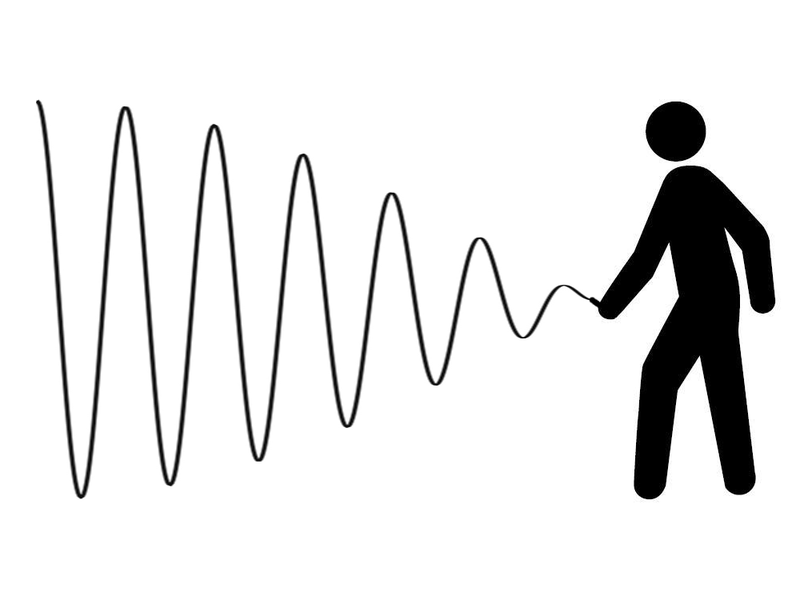 Not at all actually: as that electric field vector E oscillates up and down (or goes round and round, as shown in the illustration below, which is an image of a circularly polarized wave), it does not actually take any space. Indeed, the electric and magnetic field vectors E and B have a direction and a magnitude in space but they’re not representing something that is actually taking up some small or larger core in space. So, what can we say about it? Nothing much, perhaps. But let me try. In nuclear physics, the term ‘cross-section’ would usually refer to the so-called Thompson scattering cross-section of an electron (or any charged particle really), which can be defined rather loosely as the target area for the incident wave (i.e. the photons): it is, in fact, a surface which can be calculated from what is referred to as the classical electron radius, which is about 2.82×10–15 m. Just to compare: you may or may not remember the so-called Bohr radius of an atom, which is about 5.29×10–11 m, so that’s a length that’s about 20,000 times longer. To be fully complete, let me give you the exact value for the Thompson scattering cross-section of an electron: 6.62×10–29 m2 (note that this is a surface indeed, so we have m squared as a unit, not m). Now, let me remind you – once again – that we should not associate the oscillation of the electric field vector with something actually happening in space: an electromagnetic field does not move in a medium and, hence, it’s not like a water or sound wave, which makes molecules go up and down as it propagates through its medium. To put it simply: there’s nothing that’s wriggling in space as that photon is flashing through space. However, when it does hit an electron, that electron will effectively ‘move’ (or vibrate or wriggle or whatever you can imagine) as a result of the incident electromagnetic field. That’s what’s depicted and labeled below: there is a so-called ‘radial component’ of the electric field, and I would say: that’s our photon! [What else would it be?] 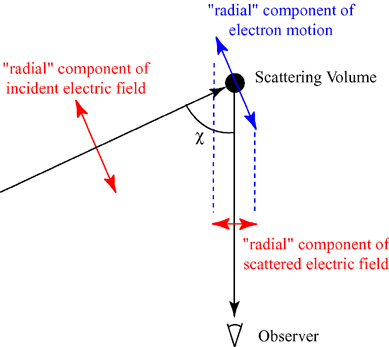 The illustration below shows that this ‘radial’ component is just E for the incident beam and that, for the scattered beam, it is, in fact, determined by the electron motion caused by the incident beam through that relation described above, in which a is the normal component (i.e. normal to the direction of propagation of the outgoing beam) of the electron’s acceleration. Now, that radius determines the area in which it may produce some effect, like hitting an electron, for example, or like being detected in a photon detector, which is just what this so-called radius of an atom or an electron is all about: the area which is susceptible of being hit by some particle (including a photon), or which is likely to emit some particle (including a photon). What is exactly, we don’t know: it’s still as spooky as an electron and, therefore, it also does not make all that much sense to talk about its exact position in space. However, if we’d talk about its position, then we should obviously also invoke the Uncertainty Principle, which will give us some upper and lower bounds for its actual position, just like it does for any other particle: the uncertainty about its position will be related to the uncertainty about its momentum, and more knowledge about the former, will implies less knowledge about the latter, and vice versa. Therefore, we can also associate some complex wave function with this photon which is – for all practical purposes – a de Broglie wave. Now how should we visualize that wave? Well… I don’t know. I am actually not going to offer anything specific here. First, it’s all speculation. Second, I think I’ve written too much rubbish already. However, if you’re still reading, and you like this kind of unorthodox application of electromagnetics, then the following remarks may stimulate your imagination. The first thing to note is that we should not end up with a wave function that, when squared, gives us a constant probability for each and every point in space. No. The wave function needs to be confined in space and, hence, we’re also talking a wave train here, and a very short one in this case. So… Well… What about linking its amplitude to the amplitude of the field for the photon. In other words, the probability amplitude could, perhaps, be proportional to the amplitude of E, with the proportionality factor being determined by (a) the unit in which we measure E (i.e. newton/coulomb) and (b) the normalization condition. Well… Be creative. It’s not that difficult to imagine some linkages. First, the electric field vector has both a magnitude and a direction. Hence, there’s more to E than just its magnitude. Second, you should note that the real and imaginary part of a complex-valued wave function is a simple sine and cosine function, and so these two functions are the same really, except for a phase difference of π/2. In other words, if we have a formula for the real part of a wave function, we have a formula for its imaginary part as well. So… Your remark is to the point and then it isn’t. OK, you’ll say, but then so how exactly would you link the E vector with the ψ(x, t) function for a photon. Well… Frankly, I am a bit exhausted now and so I’ll leave any further speculation to you. The whole idea of a de Broglie wave of a photon, with the (complex-valued) amplitude having some kind of ‘proportional’ relationship to the (magnitude of) the electric field vector makes sense to me, although we’d have to be innovative about what that ‘proportionality’ exactly is. 1. First, it’s obvious that the usual relations between (a) energy (W), (b) frequency (f) and (c) amplitude (A) hold. If we increase the frequency of a wave, we’ll have a proportional increase in energy (twice the frequency is twice the energy), with the factor of proportionality being given by the Planck-Einstein relation: W = hf. But if we’re talking amplitudes (for which we do not have a formula, which is why we’re engaging in those assumptions on the shape of the transient wave), we should not forget that the energy of a wave is proportional to the square of its amplitude: W ∼ A2. Hence, a linear increase of the amplitudes results in an exponential (quadratic) increase in energy (e.g. if you double all amplitudes, you’ll pack four times more energy in that wave). 2. Both factors come into play when an electron emits a photon. Indeed, if the difference between the two energy levels is larger, then the photon will not only have a higher frequency (i.e. we’re talking light (or electromagnetic radiation) in the upper ranges of the spectrum then) but one should also expect that the initial overshooting – and, hence, the initial oscillation – will also be larger. In short, we’ll have larger amplitudes. Hence, higher-energy photons will pack even more energy upfront. They will also have higher frequency, because of the Planck relation. So, yes, both factors would come into play. What about the length of these wave trains? Would it make them shorter? Yes. I’ll refer you to Feynman’s Lectures to verify that the wavelength appears in the numerator of the formula for Q. Hence, higher frequency means shorter wavelength and, hence, lower Q. Now, I am not quite sure (I am not sure about anything I am writing here it seems) but this may or may not be the reason for yet another statement I never quite understood: photons with higher and higher energy are said to become smaller and smaller, and when they reach the Planck scale, they are said to become black holes. So what’s the conclusion? Well… I’ll leave it to you to think about this. As said, I am a bit tired now and so I’ll just wrap this up, as this post has become way too long anyway. Let me, before parting, offer the following bold suggestion in terms of finding a de Broglie wave for our photon: perhaps that transient above actually is the wave function. You’ll say: What !? What about normalization? All probabilities have to add up to one and, surely, those magnitudes of the electric field vector wouldn’t add up to one, would they? My answer to that is simple: that’s just a question of units, i.e. of normalization indeed. So just measure the field strength in some other unit and it will come all right. […] But… Yes? What? Well… Those magnitudes are real numbers, not complex numbers. Real numbers are complex numbers too: it’s just that their imaginary part is zero. When working with waves, and especially with transients, we’ve always represented them using the complex exponential function. For example, we would write a wave function whose amplitude varies sinusoidally in space and time as Aei(ωt−k·r), with ω the (angular) frequency and k the wave number (so that’s the wavelength expressed in radians per unit distance). So, frankly, think about it: where is the photon? It’s that ten-meter long transient, isn’t it? And the probability to find it somewhere is the (absolute) square of some complex number, right? And then we have a wave function already, representing an electromagnetic wave, for which we know that the energy which it packs is the square of its amplitude, as well as being proportional to its frequency. We also know we’re more likely to detect something with high energy than something with low energy, don’t we? So… Tell me why the transient itself would not make for a good psi function? But then what about these probability amplitudes being a function of the y and z coordinates? Well… Frankly, I’ve started to wonder if a photon actually has a radius. If it doesn’t have a mass, it’s probably the only real point-like particle (i.e. a particle not occupying any space) – as opposed to all other matter-particles, which do have mass. Post scriptum: Perhaps I should apologize to you, my dear reader. It’s obvious that, in quantum mechanics, we don’t think of a photon as having some frequency and some wavelength and some dimension in space: it’s just an elementary particle with energy interacting with other elementary particles with energy, and we use these coupling constants and what have you to work with them. So we don’t usually think of photons as ten-meter long transients moving through space. So, when I write that “our concepts of amplitude and frequency of a photon are maybe not very relevant” when trying to picture a photon, and that “perhaps, it’s only energy that counts”, I actually don’t mean “maybe” or “perhaps“. I mean: Of course! […] In the quantum-mechanical world view, that is. So I apologize for, perhaps, posting what may or may not amount to plain nonsense. However, as all of this nonsense helps me to make sense of these things myself, I’ll just continue. 🙂 I seem to move very slowly on this Road to Reality, but the good thing about moving slowly, is that it will – hopefully – give me the kind of ‘deeper’ understanding I want, i.e. an understanding beyond the formulas and mathematical and physical models. In the end, that’s all that I am striving for when pursuing this ‘hobby’ of mine. Nothing more, nothing less. 🙂 Onwards!